Spy Hunter has all the required equipment for a riviting espionage adventure! Compelling Controls! 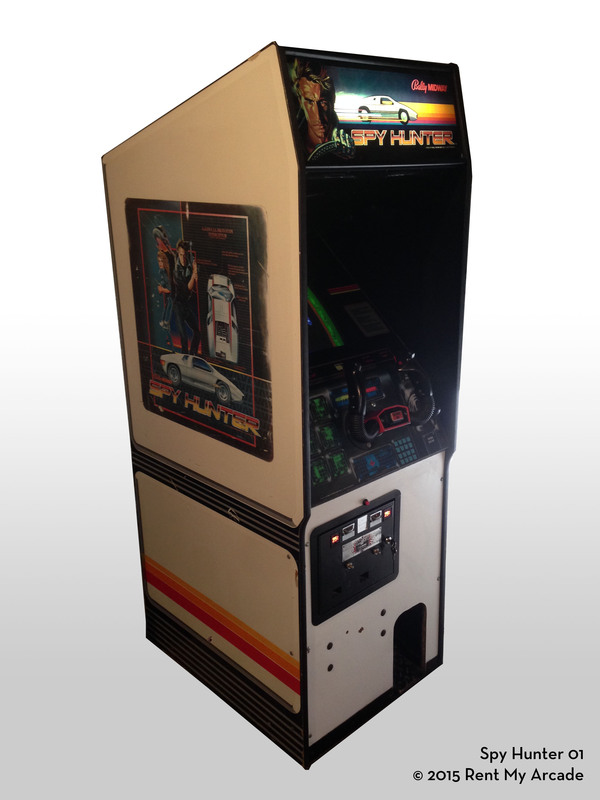 - Available weapons are indicated on Spy Hunter's impressive front panel. A flashing light indicates the approach of each new weapons van. Players must ward off 4 deadly enemies: Bullet-blasting Road Lord; Tire-slashing Switch Blade; Wave jumping Barrel Dumper; Double barreled Enforcer; Sinister Dr. Torpedo; Master sky chopper Mad Bomber. As they accumulate mileage, players earn an increased arsenal of weapons activated on the control panel: Machine Gun; Smoke Screen; Missels; Oil Slick. Intriguing Operation! - Spy Hunter comes complete with newly designed compact cockpit styling that optimized player and spectator interaction. Fully integrated game play, music, packaging and graphics all add to the excitement of the theme. Also available in upright model featuring same game play. Combination Base/Clock game. The adventure tages of time play with the base feature players expect. Enthralling Sound System! - Spy Hunter reaches a new plateau in fully dimensional sound and music with the advent of Bally/Midway's "Artifical Artist" sound system. Fully integrated with the state-of-the-art MCR III computer system, "Artificial Artist" combines both sound and intelligence to play its own solos along with programmed music. In Spy Hunter, music is creatively keyed to follow the pace of the game, offering added excitement and intrigue to the spy theme. H: 72.5", W: 24.5", D: 33.5"